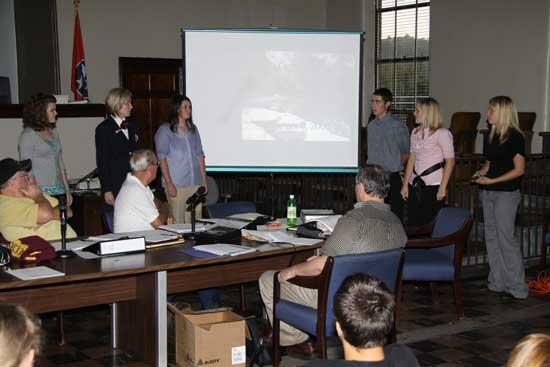 A group of Cannon County High School students present a plan for a county greenway project to the school board Thursday. A group of Cannon County High School students asked the Board of Education for their approval to proceed with a greenway project during the board’s monthly meeting Thursday night at the Courthouse. The greenway, as proposed, would first be developed from the Woodbury Lions Club building to the Main Street bridge near Chilangos Restaurant, approximately one-sixth mile. The work would be done by over 400 students representing 17 classes at CCHS, says Bob Melton, who heads the school’s agricultural department. The long-term goal of the project would be to have the greenway extend from The Arts Center, to Dillon Park, and then to the high school, following the path of the Stones River through Woodbury as much as possible, Melton said. The project would be part of the high school's place-based learning program. The planning, research, grant writing and work would all be done by students, with the assistance and under the guidance of teachers. "Place-based learning is how this idea started, and this would be a perfect project to achieve that objective," Melton said. "This is how students would gain hands-on experiences, and what they would learn would be things they would never forget and which would help them throughout their lives." In addition to the actual work, Melton said the students would also learn about teamwork, cooperation and planning. The distance of the greenway, if developed, would over two and one-half miles. "We are looking at doing it in phases," Melton said, " over a number of years. The first phase would be from the Lions Club to the bridge near the restaurant. Funding would come from state and federal grants. Melton said the cost would be approximately $1 million per mile. The greenway would be similar to the ones in Murfreesboro and Smyrna. Those two greenways were recently connected, and the hope would be that the Woodbury greenway would eventually be added to the system. The group of students told the board Thursday they wanted to build a greenway in Cannon County like the one in Murfreesboro because they thought it would be a "great idea for all of the students to work on, not for all the adults, but for the students. Let this be our project, and let us get this done." Place-based learning is an instructional strategy that helps students apply academic content to authentic problems that require critical thinking and increase student responsibility for learning, the students said. 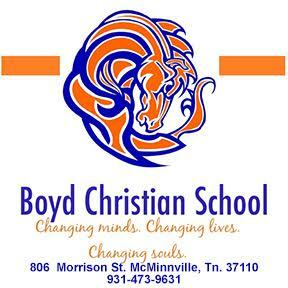 Following the presentation, the board gave its unanimous approval for the school to proceed with the project. The students will also present their plan to the Cannon County Commission when it meets in October. Also during Thursday's meeting, the board gave its OK to a proposal to change the school calendar. The most noteworthy change is the moving of spring break, which had been set for April 12-16, 2010, to March 22-26. Achievement testing dates will also change, from March 26-April 6 to April 13-20.